The objective of THROMBUS project is to conceptualize a sophisticated biological model of spontaneous or stent-induced thrombosis within Intracranial Aneurysms. In consequence, the crucial concerns are the building of a realistic scenario of the thrombosis and its associated modelling, the implementation of the code of numerical simulation based on the Lattice Boltzmann method. The consortium strengthens collaborations with biological laboratories, and hospitals to win the challenges of Thrombus. Concerning the biology, a collaboration has been initiated with the Department of Materials Science and Engineering Harvard-MIT Biomedical Engineering - Center - Edelman Laboratory (Boston USA) and fruitful exchanges are established with the ‘Laboratoire Cellules Circulantes Rares Humaines - Plateforme LCCRH’ (Montpellier France). Several collaborations with neurosurgeons and neuroradiologists are running (Finland, Germany, Switzerland, France...). As an example, The University Medicine Berlin - La Charité Hospital (Berlin Germany) is the last collaboration linked to Thrombus. The scientific research to date is focused on the development of a computational modelling of the Thrombosis phenomena including the multiscale description of the thrombosis model and the numerical simulations with micro and macro models. The strategy of simulation is based on a concept of a Scale Separation Map whose aim is to synthesize all single-scale subsystems of the full multiscale system in terms of their spatial and temporal upper and lower boundaries. 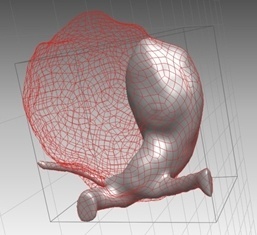 A first version of a Scale Separation Map focusses on the physical processes that trigger the formation of the thrombus inside an intracranial aneurysm. Four distinct processes take part in this approach, the bulk flow, the boundary layer, the particle transport and the thrombus formation. The associated technological aim of the project is to deliver software with an interactive end-user interface allowing the medical doctor to refine the strategy of endovascular treatment. To achieve this goal, the consortium is creating a Pipeline of Applications by using a VPH toolkit software in the area of computational bioengineering named CREATOOLS. Also a Collaborative Online System based on the COVOTEM Telemedicine System allows partners of THROMBUS the registration of the DICOM images before and after the endovascular treatment of the patient, the DICOM Images processing, the updated of the Case Report Form, and in fine a telemedicine expertise in case simultaneous multidisciplinary analysis by distant partners is required. This project involves 9 partners issued from Research Institutes and Private Companies (Covalia Interactive and ev3-Covidien). In parallel the external network of Thrombus growths month after month, and by the way, scientific collaborations and/or exchanges are initiated with international institutes such as Institute of Fluid Science - Tohoku University (Sendaï Japan), Biomedical Engineering Group - Los Andes University and Pontificia Universidad Javeriana (Bogota Colombia), College of Life Science and Bioengineering – University of Technology (Beijing China), The Intracranial Giant Aneurysm Regitry – ESMINT (European Society of Minimally Invasive Neurological Therapy www.esmint.eu) – La Charité (Berlin Germany), Swiss Neuro Institute SNI Hirslanden Clinic (Zürich Switzerland).